- Enjoy your life outdoors in addition to our superior and also sturdy rucksack molle bundle bag! 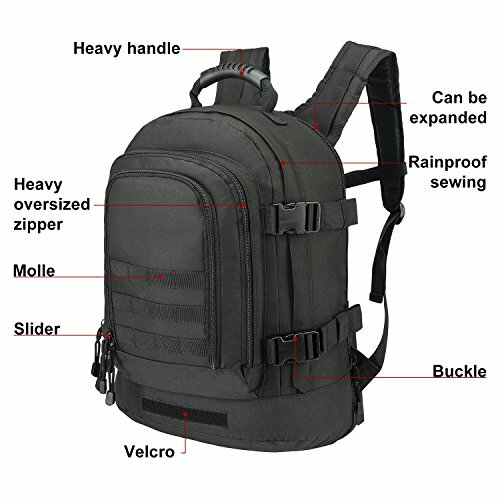 - It's crafted in to excellence, constructed from 600 denier polyester along with plastic support that is water-proof and also best for any sort of outside tasks, whether rainfall or luster, it will certainly never ever crack, saturate moist or damage effortlessly and also is going to most definitely last for years. - This 3-day extensible planned knapsack (20 1/2 ? x 15 ? x 7 3/4 ?-- 12 3/4 ? totally stretch, capability: 39 ~ 64 litres, body weight ? 2. 7) include an extra-large extensible primary compartment to fit every thing you require for a day hike, through the night or 3 vacations. It can be pressed to 39 litres or increased to 64 litres of lugging area. - Wide and also heavy cushioned waistline band to alleviate back worry, create more steady and also secure your waistline coming from unanticipated strain. 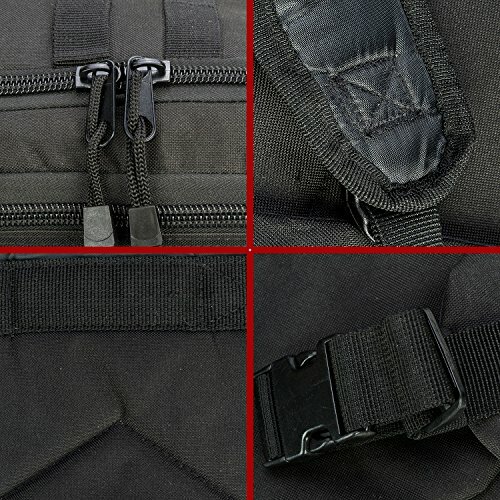 - Face molle webbing compatible for bags or permitting you to individualize your storing choice as you require. - A Velcro spot on the front lower side of the wallet can affix your favored tag. - 2 side fastening to aid the zipper fastener and also to create it a lot more steady and also safe for your traits inside of your knapsack. - Nonslip shoulder band along with breathable cloth, improved thick knitted manage are going to ensure you have a good grasp. - Modifiable height breast bone band to make sure stability and also minimize shoulder worry and also a padded back board for comfort and also breathing bearing. Click the CONTRIBUTE TO CART on top of the web page and also GET the greatest in Expandable Knapsack Currently!
? 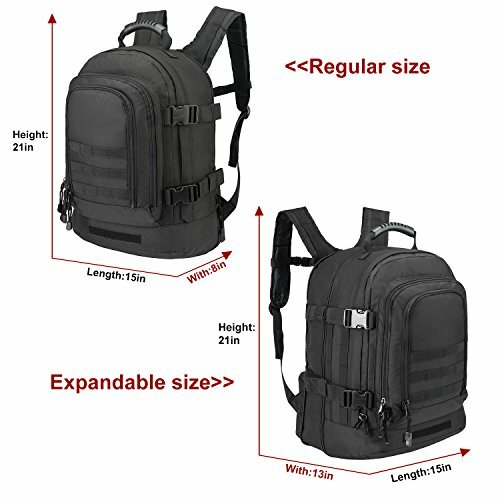 DURABLE 3-DAY EXPANDABLE BACKPACK - Are you looking for a heavy duty Backpack for your next adventure? Our Backpack is made of finest 600 denier polyester with vinyl backing. 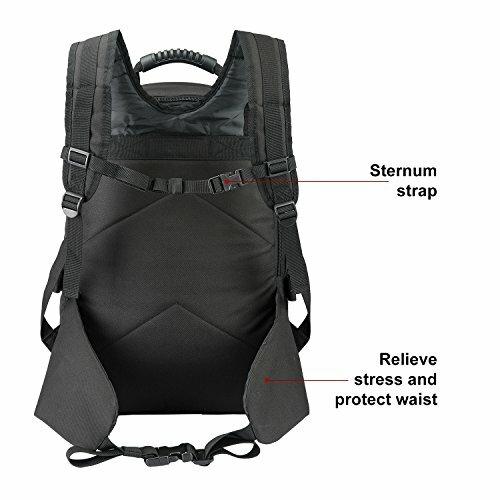 It also has a waist pack for increased safety and more comfortable experience. ? EXTRA LARGE SIZE + MESH POCKETS - Measures Size: 20 1/2"; x 15" x 7 3/4" – 12 3/4" WHEN FULLY EXTENDED; Capacity: 39~64 Liters. Weight?2.7 lbs. 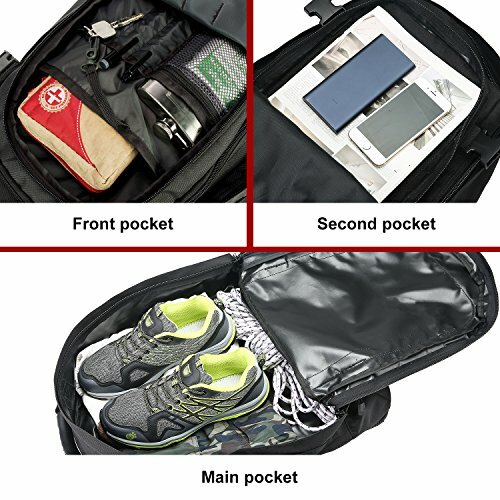 It has multiple zipper pockets and compartments so you can easier organize and find yours belongs. ? FOR ANY ACTIVE OUTDOOR PERSON - Our bag is ideal for people who like camping, hiking, traveling, fishing, hunting, climbing etc. The generous space helps you fit anything you need for a 3-day adventure outdoor. The main area expands from 5" to 10" to fit more gear. ? DESIGN + GREAT GIFT - One nice surprise is the waist strap is removable for when you are not hiking, camping and trekking. You can make it into a bug out bag or 72-hour emergency kit and just the greatest GIFT for Christmas, birthdays and much more. ? 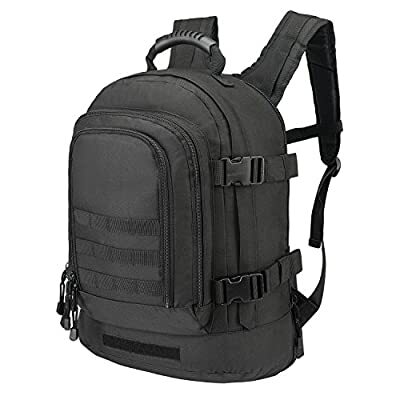 100% MONEY BACK GUARANTEE: If after you use your tactical backpack for one of it's many applications and you are not impressed with it along with absolutely loving it we will refund your money. Our world-class ARMYCAMOUSA customer service wants you to be SATISFIED with your purchase. Absolutely no risk. The backpack comes with our 100% satisfaction guarantee. Get yours and more for family and friends TODAY!